Hristo Zlatanov, 16 June 2017. At first glance, it is easy to mistake the Z2 Play for the Z Play, but there are a lot of minor differences between the two. On the front is the 5.5-inch display surrounded by sizable bezels. The bezels here are quite substantial, especially at a time when other brands are actively trimming down. The white model, in particular, has distractingly large bezels dominating the front. Above the display are a bunch of things, starting with a dual two-tone LED flash on the left, the earpiece in the middle, proximity and ambient light sensors next to it and the camera lens on the extreme right. Motorola also felt the need to squeeze its logo in here, which makes the top look even more cluttered on the white model. Below the display is the fingerprint sensor and a microphone. The sensor has been redesigned to an oval from the square shape of last year and looks much better now. The area surrounding the sensor is just vast amounts of empty space. On the right are the power and volume buttons. The power button is ridged and falls within easy reach. The volume buttons are a bit of a stretch but within manageable distance. The buttons are small but operate with a distinct click and there is no undue movement or play within them. On top of the phone is a tray that can hold two nano SIM as well as a microSD card - we obviously have the Dual SIM model here but other markets will be getting a single SIM one as well. The second microphone is also located up top. On the bottom is a USB-C connector and the headphone jack. Motorola also puts the FCC and model information at the bottom so they don't clutter the back of the phone. The back of the phone is where you will notice one of the biggest changes over last year's model. While the Z Play had a metal frame and glass back, the Z2 Play has a full aluminum body that extends to the back. What's also interesting here is the way the antenna lines have been integrated into the design. They proudly run along the edges of the back in a strip that thickens at the top and bottom, instead of being minimized somewhere in the corner. Other design changes you will notice is the camera bump, which sticks out considerably from the back, and a golden contact patch at the bottom. Both of these are designed to work with the Moto Mods; the camera bump helps hold the Mods in place and the contact patch connects them to the phone. Neither are admittedly attractive and look like bit of an eyesore, especially the large contact patch at the bottom. Only way to hide them is to, well, use a Moto Mod. The overall build quality of the phone is phenomenal. It feels like a solid slab of metal in hand and the switch from glass to metal on the back also gives further peace of mind. The phone also has a water-repellant nano coating that provides further protection from splashes. As for handling, the Z2 Play does feel awkwardly wide, not to mention unnecessarily tall due to the massive chin, but the reduced thickness and weight over last year's model is definitely appreciated, especially when you slap on some Mods. The Moto Z2 Play has a 5.5-inch Super AMOLED display that seems to be carried over from the previous model. Out of the box, the display looks great, with excellent contrast, color temperature, viewing angles and vibrant colors. If you want more natural colors you can switch the display to Standard mode from the settings. Even in Standard mode, the colors look great and because they were closer to the sRGB color standard, we decided to leave it there for the entirety of the test duration. The only problem we had with the display was with sunlight visibility. Although AMOLED displays have come a long way, the one on the Z2 Play washes out considerably under the sun and it can get really hard to see what's going on the screen, especially if you are taking pictures or videos out under the sun. The Moto Z2 Play has a 3000mAh battery, which is quite a step down from last year's 3500mAh. Considering not much has changed on the hardware front we didn't expect the battery life to be miraculously on par with the Z Play despite the smaller size. Which is fine, because it isn't. The Z2 Play gets about 5-6 hours of screen-on time, which is about what we expected. But the phone has excellent standby time, which allows it to stretch that usage over two days with a fair amount of ease. We found ourselves charging the phone every two days instead of one. Admittedly, the last year's model did better here but the new Z2 Play is no slouch and acquits itself quite well. The phone ships with a 15W Motorola TurboPower charger that charges the phone from flat in about 1 hour 40 minutes. The Moto Z2 Play has just a single loudspeaker on the front. We feel Motorola could do better here and provide stereo speakers like they did on the Nexus 6. The single speaker up front sounds fine when holding the phone in portrait but sounds unbalanced and one-sided when holding the phone in landscape. The audio quality itself isn't great and the speaker sounds very thin and metallic. It does get fairly loud though so ringtones and GPS navigation sounds will be heard clearly. The fingerprint sensor below the display is one of the best in the business. It is incredibly fast to unlock and not once did we have any issue with the sensor not recognizing the fingerprint properly. This really should be standard now but we are still not quite happy with the level of accuracy we see with other manufacturers, even though speed has improved across the board. Having the sensor on the front also helps with the accuracy as it is really difficult to put your finger on it incorrectly when it's right in front of you instead of somewhere on the back where you can't see. It's impossible to talk about this phone without mentioning the Moto Mods, which are a big part of the Moto Z proposition. 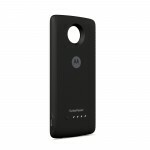 Last year, Motorola announced Moto Mods for the Moto Z and Z Play, which used magnets and physical contacts to connect to the back of the phones. Models launched last year included the Hasselblad True Zoom, Moto Insta-Share Projector, and JBL SoundBoost, among others. 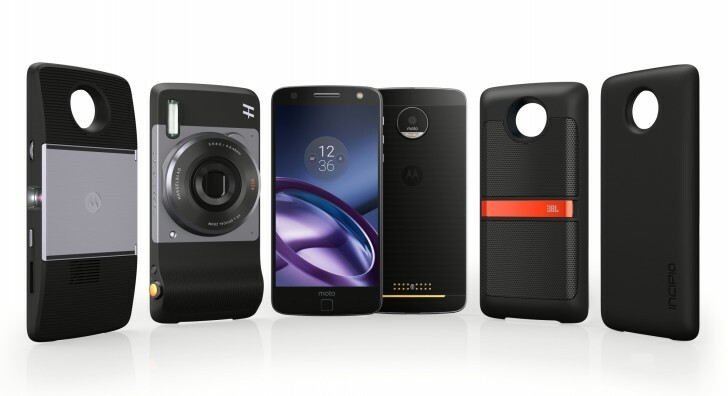 This year, the Moto Mod story remains the same, but now there are many more models. More importantly, because Motorola took this bit more seriously than, say, LG, the Mods are actually all compatible with last year and this year's Moto Z models. We didn't actually get to review any of them but we did get to spend some time with all of the new and old Moto Mods available this year. 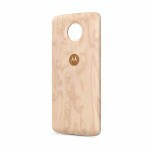 The first of the lot is the Moto Style Shell with Wireless Charging, which is one of the most basic Moto Mod you can get. Compared to last year's Style Shell, it adds wireless charging support to the phone. The Style Shell is thin enough that when you snap it on the phone it barely adds any thickness and also hides the camera bump and contact patch. 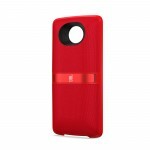 It also adds an extra layer of protection to the back so you don't have to think twice before placing down your phone. The Moto TurboPower Pack is Motorola's own external battery mod, after the third party ones from Incipio and Mophie announced last year. It includes a massive 3490mAh battery that can potentially double your phone's battery. It also uses fast charging to quickly charge your phone. The Mod's battery itself can be fast charged independently with the USB-C port placed on the side or charged along with the phone. Along with the battery, it also doubles the thickness of the phone although it's still a nicer experience than having a separate power bank. The JBL SoundBoost 2 is a successor to last year's SoundBoost. The design is a lot more refined this year and it's also splashproof. You still get the kickstand so you don't have to keep the phone face down or block the speakers. The Mod also has its own battery that doesn't drain your phone. Although fairly loud, the SoundBoost 2 still doesn't sound as good as having a Bluetooth speaker. Also, even though it feels good to hold in hand, the added thickness makes it difficult to carry around in the pocket. 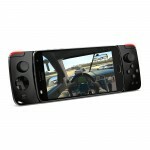 The last of the new Mods is the Moto GamePad. It lets you slot the phone in between and turn it into a portable console. In our testing, it didn't quite work with any of the games we tried. Also, the build quality was extremely plasticky and didn't look or feel great at all. Last year's Mods are still available, including the Hasselblad and projector Mod, along with the Incipio vehicle dock. Unfortunately, the problem with the new Mods is the same as the one last year. Most of them are too expensive and add a lot to the cost of the phone. Also, many of them can easily be replaced by cheaper accessories. You can get a power bank to replace the TurboPower pack, which won't be as neat but will definitely be a lot cheaper. A Bluetooth speaker will sound much better than the JBL SoundBoost 2 and again, be cheaper. And while we appreciate the optical zoom and xenon flash on the Hasselblad mod, the image quality, lack of 4K video, massive size and absurd pricing make us want to stay away from it. It's mostly the Insta-Share Projector mod that we felt offered something unique and useful that cannot be easily and cheaply replaced. 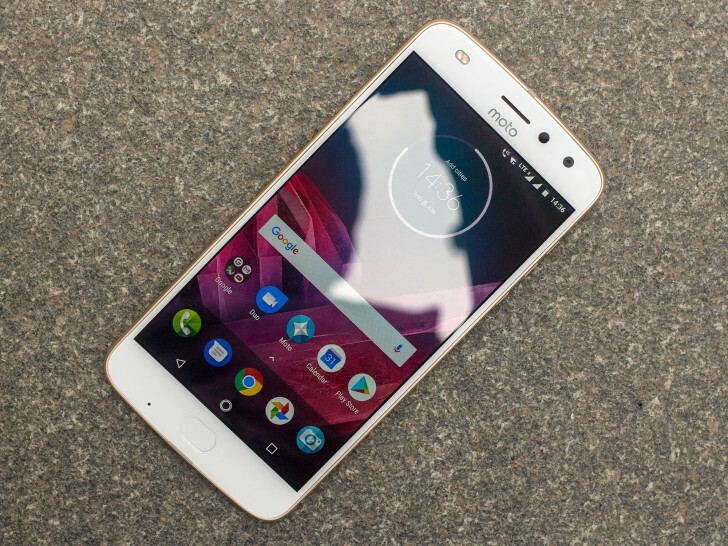 So while we really like the design and engineering of most of these Mods, their high price and easy replaceability with cheaper alternatives make them dispensable, especially for a mid-range phone like the Moto Z2 Play.